This is a horribly inappropriate time to admit this, but I am not sure where or how I met Ashley. Since The Buckarette Collection, she’s just been there. When The Buckarette Collection ran it’s first brand rep search, I did something unheard of at the time: categories. In my mind, there was no way to pit a professional rodeo wife against a ranch wife, a queen against someone showing western pleasure, and agvocates didn’t even have a voice in the "brand rep” space. So, I made one! We offered spots for Competitors, Queens, Ranch Wife/Ranch Rodeo, Entrepenuer, and Agvocate. Ashley earned the Agvocate spot that year, during her rein as the Nevada Beef Ambassador. Somehow, we’ve been loosely connected ever since. I have learned two things from my relationship with Ashley. Relationships change. At one point, I promoted Ashley and her work for the beef industry. Now, Ashley has supported my work in business and writing. Remember that before you take anyone for granted because I am so thankful to know this gal! Keep it classy! Despite everything, Ashley keeps it classy. I’m sure I am not aware of every challenge she has encountered, but that’s the point! She is not on a regular, public soap box and I admire her for that, especially in these modern times. Ashley is as beautiful on the outside as she is on the inside, so trust me when I say, READ ON! 2. 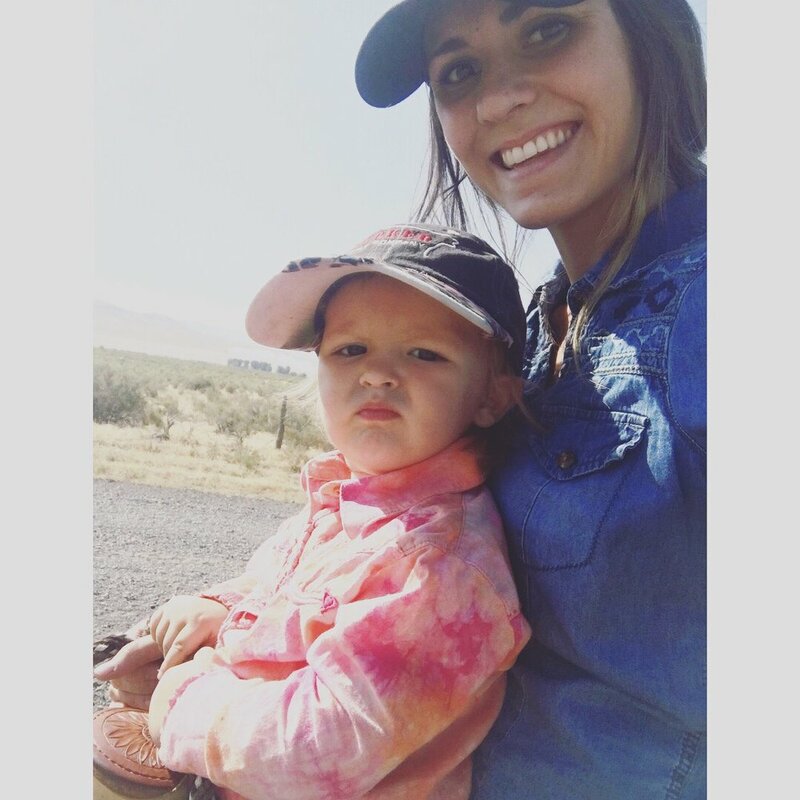 You have worn a lot of hats- Nevada Beef Ambassador, brand rep, model, rancher, mom, ad sales rep- how have all these experiences brought you to your newly-appointed position as Editor of The Nevada Rancher Magazine? This is a tough question because I am always telling myself that I need to slow down and learn to say no when asked to put on an additional hat! Where I am today has all come back to one key factor. I suppose I started “building my resume” as a child. I was born into a ranching family. I am the 6th generation rancher in Paradise Valley. I was very active in 4H for 13 years and that extracurricular involvement carried on into my high school and college years. My Father started an amazing cow deal with me. My cow herd started with my 1st 4H heifer when I was 9. I kept every heifer calf she would have along with the ones those heifers calved. Any bull calves my cows dropped, Dad would trade me for one of his heifer calves. My cow herd quickly grew, that trade deal ended when I moved back home. Apparently I was getting the better end of the deal. In high school I served on the FFA officer team 3 years and ended up holding the President position during my senior year. College came quickly. I joined the Aggies Club and helped face issues with the Agricultural program at Great Basin College along with community events/fundraisers and field trips. Although our efforts didn’t save the program, I am thankful I was able to finish out my courses before they cut it. I also held a hostess/waitressing job on top of my course work the first year. I interned for the Nevada Cattlemen’s Association that lead me to filling a position in the Nevada Department of Agriculture- Elko Livestock brand office. During that time is when I started my first brand representing and “modelling” gig. I wouldn’t consider the boutique photoshoots as modelling because it is always a great group of gals who like to wear pretty clothes and laugh while doing it. Next came competing for the Nevada State Beef Ambassador title. What a learning experience that was. I enjoyed every second of being the state beef ambassador, especially the travelling to consumer promotions and social media outreaches. That was by far, one of my favorite years. As the state beef ambassador I was required to write a blog along with submitting monthly articles to print publications. One of those publications happened to be the Nevada Rancher Magazine. I don’t feel writing is my strong suit and I honestly have never found it that enjoyable! Along came BobiRose, my daughter. Never had I thought I would become a mother at the age of 21 yet alone a single mom. I finished out college online and graduated with a 4 month old. My life of travelling, conventions and going out with my friends was put on hold. BobiRose has been the greatest blessing of all. She continues to teach me patience and kindness daily. I saw an ad in the local paper for the Nevada Rancher Magazine-sales rep position. I met the position’s hiring requirements but had absolutely no sales experience, let alone advertising sales. I submitted my application the night before the deadline, I didn’t discuss it with anyone, I just did it. The next day, I had an email notification requesting an in-person interview. I landed the job. I didn’t know how I was going to juggle being a new mother and working from home. Now, two years later I was promoted to Editor. I still handle the advertising sales on top of layout and design of the magazine in addition to selecting the editorial content. I work from home expect for 8 days when I commute 80 miles round trip to the Winnemucca Publishing office. That one key factor in my life has been: Believing. Not just believing in myself but having a strong support team that also believes in me. I have had and continue to have EXTREMELY motivational and influential people in my life. Obviously, starting with my family. The list continues on to my 4H leaders, FFA advisor, friends (and their parents), coworkers, college professors and so many others. They are constantly in my corner cheering me on when I start doubting myself. These type of people are not a dime a dozen. I am forever thankful for them! 3. For work or business, you're always on the road! Any must-haves when you're travelling? Water, snacks (usually trail mix), sunglasses, chargers and good tunes! I have started listening to podcasts while I drive as well. 4. You are always so put together! Any favorite shops right now? Ha! I hardly feel put together most of the time. When I shop its always online. Currently my favorite places to find cute pieces is on Poshmark. It is a “used clothes” site that becomes addicting. I always find great deals on there. I am forever crushing on the Frosted Cowgirls Boutique, owner Rikki, is such an inspiration. Another fun thing I am signed up for through the Buckle store is “Buckle Select” my personal shopper, Megan Breinig. She comes from a cattle background and selects pieces to fit my style. Whatever doesn’t make the cut is returned for free! 5. What is the best advice you received about being a mom? I was showered with advice and kind words when I become a mom. The best note I received was from Jordanne Pruitt. Jordanne was introduced to my life through you which I am ever so thankful for. A line in her note said, “There will be days nothing makes sense and at times it will be hard as hell, but stand on God’s promises. All things work together for his good. You’ve got this.” Her encouragement continues to replay in my mind. 6. As part of a multi-generational ranch family, what do you feel are our biggest hurdles to keeping our youth involved with the beef industry? I think one of the major hurdles to keeping the next generation involved in the industry is patience and teaching opportunities. We need to focus not so much on our youth but the ages in college and high school. The younger generation needs the generation before us to educate us. When we ask why, don’t just say because we’ve always done it that way. Explain why you do it don’t get frustrated with us for asking questions. Another thing I feel is pressure. There is an amount of pressure that we are expected to take over the ranch someday or we’re expected to follow in our parents footsteps. Let your kids go experience life for awhile, let them work for different people and see new places. Then trust that you raised them to thrive and have a passion for the Ranching lifestyle, that they will return and love being home. 7. What is your favorite cut of beef and how do you like to prepare it? I’m a sucker for a good tri-tip. My mother has served tri-tip to our branding crews for as long as I can remember. She bakes hers but I prefer to use the Traeger. I marinade it with Worcestershire sauce, brown sugar, garlic powder, salt and pepper. Cook on the Traeger 40 minutes on 400 degrees. You can use a meat thermometer but I can tell by poking to see how done it is. Remove and give time for it to rest, that’s the important part! It allows all the juices to be absorbed back into the meat. Finally slice against the grain. A tri-tip will have grain going two directions so you’ll have to turn and readjust. This affects the tenderness of your meat! 8. Juggling everything you do, how do you keep organized? I actually struggle with staying organized. This is something I’m constantly working on! I get up early, before BobiRose wakes up, drink coffee-check emails- and make a top priority to do list for the day/week. Keeping good notes is a must- do for me. I always say, oh I won’t forget such and such. Guarantee I will forget and kick myself for not writing it down. Pen and paper or even the notes feature on my phone are crucial. 9. Based on your experience, what does it take for western fashion brands to succeed online? I think having key influencers repping your brand is a great route. I know some fabulous fashion influencers that I “follow” on social media who are always looking great and letting their true and raw selves shine through their digital accounts. Another thing is collaboration with other boss babes. Join the boutique hub. Don’t compete with each other, but compliment each other. Work together tag each other in posts, host joint giveaways, come together for out of the world photoshoots etc. Grow from each other. Be original. The social media algorithms are also hard to beat. Constantly post solid and strong content with call to actions. “Love is patient love is kind”. A line from Corinthians 13:4-8. It’s the screensaver on my laptop. A perfect reminder. Ashley pictured with Jon Griggs of Maggie Creek Ranch, Elko, NV and one of Ashley’s mentors.